A request for Tardis218 on deviantart. Colonial names done with help from Anton Larsson. Full size here. This map shows a world in which Sweden, following the Thirty Years War, managed to hold on to its status as the premiere power in northern Europe, playing Poland and Russia against themselves to remain in control of the Baltic in almost every way. Now, hundreds of years later in the mid-20th century, Sweden rules an empire across the world, from North America to the Pacific Islands. It is a rich and powerful empire built on trade within and without the empire of the many goods Sweden manufactures, farms, or mines. 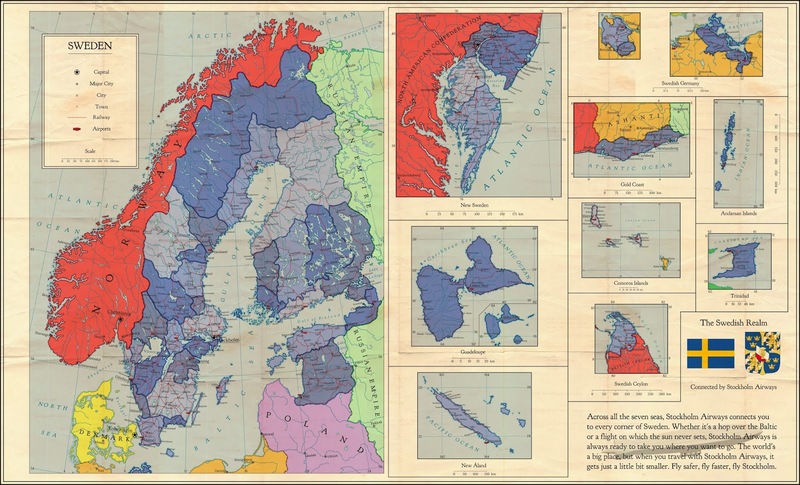 The Swedish Empire, however, is interesting in that it is not an empire in the traditional sense. Technically, Sweden is still a kingdom and all lands, no matter where they are, are as much a part of Sweden as Stockholm is. Rather than colonial possessions or separate parts of government, Sweden's colonies have a say within Sweden's parliament. This has led to a greater mixing of peoples throughout the Swedish Realm, with Africans and Pacific Islanders being found all around the Swedish metropole while European Swedes can be found in the Gold Coast, Comoros Islands, and elsewhere. Interestingly enough, this system, while good for a colonial power, will ultimately be the downfall of the Swedish colonial empire in the latter half of the 20th century. Educated men (and women) from Africa and Ceylon during the time period this map is set in will later come back to their homelands with a better idea of how to lead their people, and thus eventually free them from direct Swedish rule. Many former colonies, later in the century, will remain somewhat tied to Sweden, however, like the Commonwealth of our own world. In the early-to-mid 20th century, the odd man out, though, is New Sweden. It straddles the line of colony as it is technically part of the North American Confederation, a very loose group of former English, French, Dutch, Spanish, and Swedish colonies in the New World that have banded together to form a single entity. Due to the loose nature of the confederation, New Sweden retains certain relationships with the metropole, and is thus often considered part of the Swedish Realm. With nearly a million Swedes having migrated to New Sweden from 1850-1900 alone, it is little wonder why New Sweden is still so tied to its mother country. Anyway, I hope you enjoyed this map. It was a lot of fun doing this request. Look for a short story based on this map to come out sometime soon! If you enjoyed this map and want to support me, check out my Patreon. For just $1 a month, you can get bonus rewards, including an extra Patreon-exclusive map!